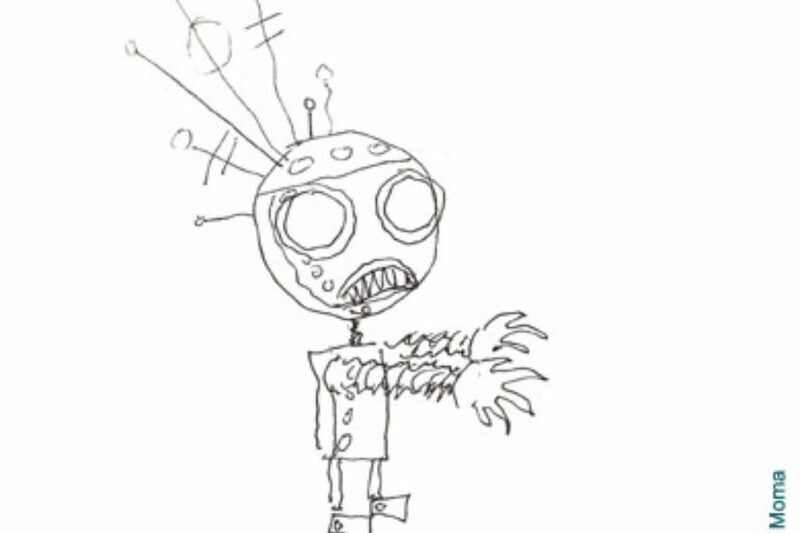 To celebrate the launch of the new 'World of Tim Burton' exhibition in Genk we have replaced the MoMa video with the newest in the series! 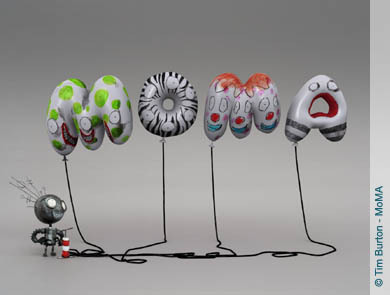 To help promote a major exhibition of Tim Burton's work at the Museum of Modern Art New York, Mackinnon & Saunders produced a 30 second promo film designed by Tim Burton featuring a stop motion robot and CGI balloons to spell out the MoMA initials. This blockbuster exhibition has since been showcased at TIFF Toronto, ACMI Melbourne, LACMA Los Angeles, La Cinematheque Francaise Paris, SemA Seoul, Mori Art Museum Tokyo, Max Ernst Museum Bruhl, Lafayette Art & Design Center Shanghai and ArtisTree Hong Kong. All but one of the venues had their own version of the animated promo. 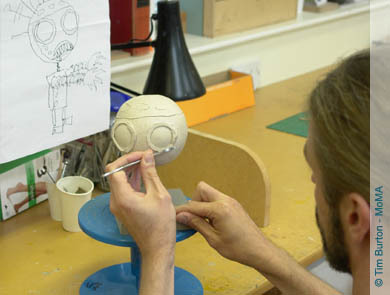 Lead CG artist Simon Partington took up the challenge. Over the course of two days Partington and his team nailed down a technique that not only gave the light fluffy feel of big rubber balloons but also had the slightly staccato feel of stop motion. The tests were rushed over to Burton who was deep into post production on his present feature, Alice in Wonderland. “There was a huge sigh of relief when Tim gave the thumbs up, in all honesty I don’t know how we’d have got this done in time without the Flix team’s work,” MacKinnon smiles. 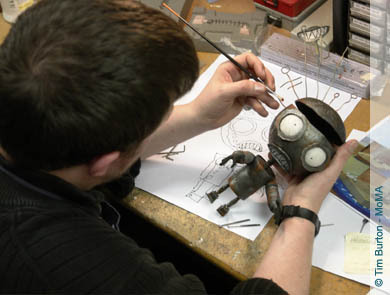 Work on the robot puppet was also now moving apace. 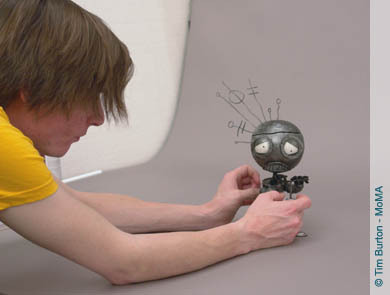 Lead puppet makers Caroline Trott and Richard Pickersgill completed mould making and cast out body parts in fibre glass, rubber and silicone whilst at the same time constructing the intricate metal skeleton which fits inside the puppet and enables it to hold any pose during the animation process. Although the shoot took three long days over a weekend the team’s experience and preparation paid off and the shoot went off without a hitch. The precious footage was beamed off via a high speed data link ready for Tim Burton to oversee final post in Los Angeles.